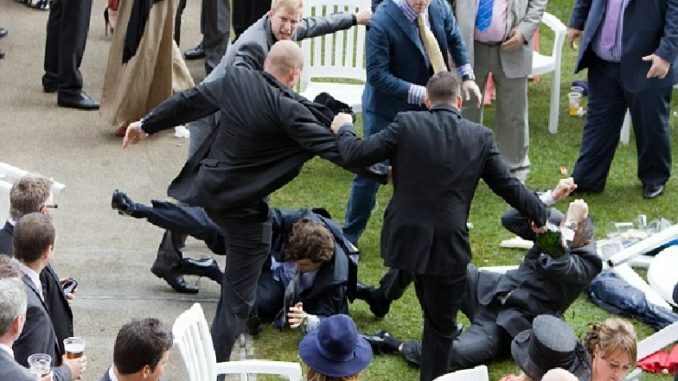 Britain’s Royal Wedding turned into a Royal Rumble yesterday as hundreds of drunken guests got involved in a massive punch up. Chairs and bottles went flying through the air as Prince Harry was seen sticking the boot into several guests who were on the ground. Patrick Dempsey is a musician with the band who were hired for the reception and he explained what happened. Witnesses described a mass brawl that spilled out into the beer garden and had several guests diving for cover. Lady Penelope Kensington is a first cousin of Prince Charles and she said everyone seemed to be having a good time but then suddenly the place went mental. Manager of the Windsor Hotel Simon Wilson told reporters that he’s not taking any more Royal Wedding bookings for the foreseeable future.